The NITECORE NL1665R is a 650mAh 16340 micro-USB rechargeable battery that's compatible with multiple 16340 flashlights, headlamps and other electronic powered devices. No charger is needed to recharge this battery, it's equipped with a built-in micro-USB port that allows users to charge the battery directly using any compatible USB power source. Yet, the battery does have the ability to recharge using a traditional charger providing multiple recharge options for users. The NL1665R is equivalent to 500 pairs of CR123 batteries and has a life span of over 500 recharge cycles, helping to reduce the cost of energy to users over time.Package Contents: NITECORE NL1665R 650mAh 16340 Micro-USB Rechargeable Battery. Model: NL166. 4x NiteCore NL166 650mAh RCR123A/16340 Li-ion Battery. Directly from Authorized Nitecore Dealer. Capacity: 650mAh. The NITECORE NL1665R is a 650mAh 16340 micro-USB rechargeable battery that's compatible with multiple 16340 flashlights, headlamps and other electronic powered devices. No charger is needed to recharge this battery, it's equipped with a built-in micro-USB port that allows users to charge the battery directly using any compatible USB power source. Yet, the battery does have the ability to recharge using a traditional charger providing multiple recharge options for users. The NL1665R is equivalent to 500 pairs of CR123 batteries and has a life span of over 500 recharge cycles, helping to reduce the cost of energy to users over time.Package Contents: 2x NITECORE NL1665R 650mAh 16340 Micro-USB Rechargeable Battery, Micro USB to USB Charging Cable. 20x Nitecore RCR123A NL166 16340 650mah Battery. Internal safety protection design. External safety protection design. Capacity: 650mAh. 100% Brand New, Nitecore (Sysmax) Original product Features: Can be recharged via Micro-USB or Charger CE and RoHS Certified Power Indicator on battery: Red indicates charging and Green indicated fully charged Built-In PTC inhibits high current surges and shorts Environmentally friendly and can be recharged over 500 times Comes with Nitecore's 12 Month Warranty Specifications:. 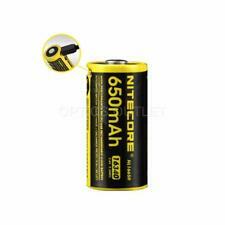 100% New Nitecore NL1665R 16340 650mAh 3. 100% Brand New, Nitecore (Sysmax) Original product For High Drain Device Features: · Built-in IC Protection circuit · Voltage 3.7v, Capacity 650mAh, 2.4Wh · Compatible with Nitecore and most brand flashlight Package Includes (with original blister pack): · Nitecore 16340 650mAh 3.7v Protected Rechargeable Li-ion battery x4 Brand Nitecore MPN NL166 Type RCR123A Quantity 4 UPC 6952506490318. Trending at $21.45eBay determines this price through a machine learned model of the product's sale prices within the last 90 days. Model: NL166. 1x NiteCore RCR123A NL166 16340 650mah Battery. Capacity: 650mAh. We will not be responsible with unexpected delay like weather condition etc. 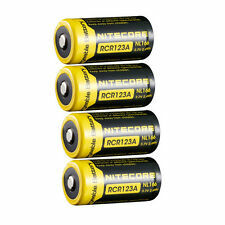 100% Genuine Nitecore NL166 RCR123A Batteries. Battery Specification: RCR123A 16340. Capacity: 650mAh. Battery Pouches. Air Filter Adaptors. Battery type: Li-ion. Battery Converters. Cell Phones & Accessories. 100% Genuine Nitecore NL166 RCR123A Batteries. Battery Specification: RCR123A 16340. Capacity: 650mAh. Batteries & Related. Flashlight Head. Weight: 28g. Oxygen Sensor. Steering Wheels & Horns. Battery Specification: RCR123A 16340. 100% Genuine NITECORE batteries. Capacity: 650mAh. Battery Pouches. Air Filter Adaptors. Battery type: Li-ion. Battery Converters. Cell Phones & Accessories. Model: NL166. 4 x NiteCore NL166 650mAh RCR123A/16340 Li-ion Battery. Directly from Authorized Nitecore Dealer. External safety protection design. Internal safety protection design. Weight: 17.8g. Model: NL166. 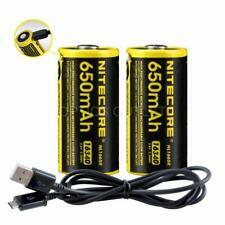 8 x NiteCore 650mAh RCR123A/16340 Battery. Capacity: 650mAh. Weight: 17.8g. 20 x Nitecore RCR123A NL166 16340 650mah Battery. Internal safety protection design. External safety protection design. 100% Brand New, Nitecore (Sysmax) Original product For High Drain Device Features: · Built-in IC Protection circuit · Voltage 3.7v, Capacity 650mAh, 2.4Wh · Compatible with Nitecore and most brand flashlight Package Includes: · Nitecore 16340 650mAh 3.7v Protected Rechargeable Li-ion battery x2 Brand Nitecore MPN NL166 Type RCR123A Quantity 2 UPC 6952506490318. Product Code NL1665R. Nitecore NL1665R Battery x 1. Capacity 650mAh. Built-In PTC inhibits high current surges and shorts.